Bishop John Chane’s lawsuit is here. 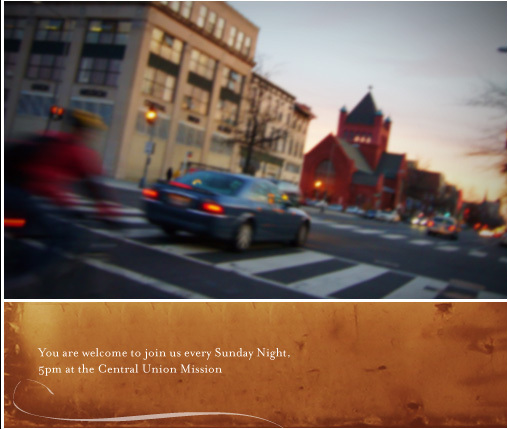 Central Union Mission is a highly-respected mission outreach to the homeless of Washington, D.C. Where other city outreaches to the homeless fail, Central Mission remains a crucial component to the church’s commitment for justice and compassion for all. You can read more about the amazing work of Central Mission here. I first became engaged in Central Union Mission when I assisted on an Alpha Course that was sponsored jointly by Central Union Mission and Christ the Redeemer Church in Virginia. To better serve the city and it’s people in crisis, Central Union Mission plans to relocate to the former Gales School which it is all ready renovating for the move. You can read more about that here. That the Bishop of Washington – with the backing of his allies – would seek to destroy this model for mission in the city is one thing. But it’s far, far more personal than that. La vengeance est un plat qui se mange? UPDATE: SF has some interesting comments here. The lawsuit appears to be against the District of Columbia, charging them with supporting a religious institution by donating the Gales property to the Central Union Mission.I wonder what Anglican Curmudgeon thinks of this. Wow, this just left me gobsmacked! I nearly blew out my frontal lobes trying to get my brain around the idea of an alleged shepherd of the church taking a stand like this. I’m not the bishop’s judge, but it would almost appear that the august bishop has been given over to a reprobate mind. May the Lord deal mercifully with him. Well, I haven’t heard of any CANA parishes in the Diocese of Washington that Chane can sue. He has to sue <>someone<>. It would be horribly unfashionable not to. Uhh, let’s see…doesn’t his cathedral have a Congressional charter? Wasn’t is designated as a ‘national house of prayer’ to be managed by the Protestant Episcopal Church? Hasn’t his church given shelter to all sorts of congregations in need , even non-Christian? Sure it has a Congressional charter. And of course, they have sheltered their inferiors from time to time. But this is something being done by the competition. On his turf. In his territory.Does anyone know if teh Nat Cat has hosted a production of West Side Story? Has Bishop Chane been heard humming the ‘Jet Song’? Well this is certainly a disgrace. I expect his grace, Bishop Chane, has not attended any of the functions at the mission. In years past I was also involved in Alpha presentations, in retreats and talks at the mission through one of our earliest members here. Indeed, it’s a source of great pride that at the very first worship service of Church of the Spirit, held at my house in the late 90’s, we had each person present sign in, and that included one visitor from the Mission who came out with a couple who were hosting him for the day. His signature is up on the wall at Church and whenever I see it I remember how the church is supposed to be about reaching out to all people. And now, each time I think the Episcopal Church could not possibly sink any lower, I am proven wrong. MDGs? Relief of human need?Nah, Iranian Mullahs and LGBT infatuation. Not life, but death.Ah, but he has a big, fancy building from which to inflict garbage on the world.Matthew 23. “The Episcopal Church Sues You” … amazing.That is precisely what it says on one of the cards I flip … on my soon-to-be-YouTubed Dylanesque music video: Subcutaneous Sinsick Blues.I am having trouble with the video resolution, else it would already be posted. Let me know if you want to see a super-sekrit advance copy of the song/video. OT:BB – I really like reading your stuff, but I find it extremely difficult and tiring for my eyes, which are a few yrs older than yours, to try to read small white type on a black background. Is there anything you can do to help some of us fogies w/ the stewardship of our eyes? Sustainability and all that…. Can you set the font larger (or is there a way I can? ), or change the color scheme? Held:Respondents do not have standing, either in their capacity as taxpayers or as citizens, to challenge the conveyance in question. Pp. 471-490. (a) The exercise of judicial power under Art. III is restricted to litigants who can show “injury in fact” resulting from the action that they seek to have the court adjudicate. Pp. 471-476. (b) Respondents are without standing to sue as taxpayers, because the source of their complaint is not a congressional action but a decision by HEW to transfer a parcel of federal property and because the conveyance in question was not an exercise of Congress’ authority conferred by the Taxing and Spending Clause but by the Property Clause. Cf. Flast v. Cohen, supra. Pp. 476-482. (c) Nor have respondents sufficiently alleged any other basis for standing to bring suit. Although they claim that the Constitution has been violated, they claim nothing else. They fail to identify any personal injury suffered as a consequence of the alleged constitutional error, other than the psychological consequence presumably produced by observation of conduct with which one disagrees. That is not injury sufficient to confer standing under Art. III. While respondents are firmly committed to the constitutional principle of separation of church and State, standing is not measured by the intensity of the litigant’s interest or the fervor of his advocacy. Pp. 482-487.
traditionalanglican: Interesting your posts, as my first reaction was to wonder what was the “good” bishop’s standing. I hope the courts throw it out quickly…but in DC, you never know. I suspect other than pettiness, the real reason for this suit is simply to punish the already lawsuit stretched CANA congregations in Virginia…and to threaten other potentially wayward orthodox parishes everywhere. Quoting in French looks classy and intellectual when you get the quote right, BB. Does anyone know if the bishop is attending the Iftar for Ahmadinejad in New York on Thursday? He is such a foreign policy afficianado. I’ll never forget hearing him tell the International Relations Committee at General Convention that he knew without a doubt that there was no forced abortion in China. He had dinner at the Chinese Ambassador’s house, and he assured him of this. And of course, two years ago he hosted the previous president of Iran, Khatami, at National Cathedral. Could that be considered mixing church and state? As someone who worked with the homeless in DC on the Grate Patrol for over ten years, and even applied for (and received!) a small grant from the Diocese of Washington under Bishop Haines for our work with the street people, I find this absolutely appalling. I thought ending with served was the joke. The well known quote is using the metaphor of serving food, but by leaving off the last word, it suggests being served with a lawsuit.